As a PC RPG focused website, it's been a while since we covered anything PnP. The last prominent instance of that, I believe, was our 2014 review of Monte Cook Games's Numenera, on which the upcoming Torment: Tides of Numenera by inXile is based. Well, recently, Monte Cook Games contacted us to see if we were interested in reviewing Torment: The Explorer's Guide, a PnP sourcebook accompanying the video game and exploring the same region of the Ninth World. Given that Tides of Numenera is a game a lot of people here are looking forward to, it shouldn't come as a surprise that we agreed to review the new sourcebook. Thankfully, esteemed community member and everyone's favorite Pillars of Eternity reviewer Prime Junta agreed to help us with that, and was prompt enough to write up his impressions that we are publishing this on the day the review embargo has been lifted. 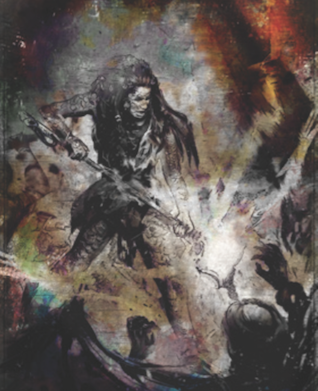 Torment: The Explorer’s Guide is a pen-and-paper sourcebook which describes the setting for inXile Entertainment’s upcoming Planescape: Torment successor. 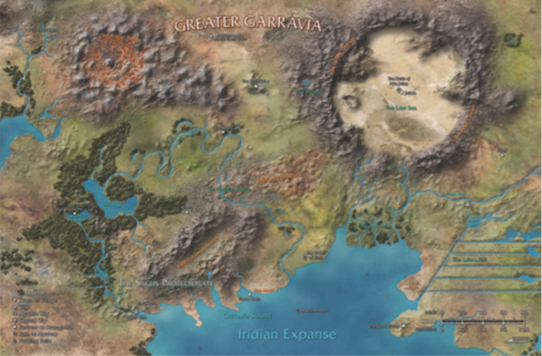 It’s about Greater Garravia, a region around an inland sea beyond the Beyond (a region described in the Numenera corebook). Monte Cook Games made it clear to us that it is not a strategy guide, hintbook, or supplement for the cRPG; rather, it is intended for game masters who want to run pen-and-paper campaigns in the Last Castoff’s footprints. Other than the relatively unproblematic descriptors and foci, the translation of cRPG gameplay into pen-and-paper form has not been altogether successful. One of the most notable features of Castoffs is their extreme resilience and rapid healing. The Guide mentions this in the description, but provides no mechanical explanation of its gameplay effects, leaving that entirely to the GM to arbitrate. Instead, it introduces a Tidal Surge mechanic which triggers whenever the Castoff takes damage: the Surge passes some of that damage to someone else in some particular form, fixed on character creation. One castoff might cause a selected enemy to go blind, another might cause him to get stunned, or run away in fear, or take extra Intellect damage. This is shallow and repetitive, an automatically-applied awesome-button mechanic requiring no thought to use, and which will get boring fast – more so if playing with a full party of Castoffs. Ouch. I believe George Ziets was involved with the computer game version of the Bloom, so I wonder if his designs influenced how it's portrayed in the sourcebook too - and why it stands out compared to other locations. Warning: this review may contain mild spoilers for Torment: Tides of Numenera. A note, folded into a pyramid in a particular way, makes a mysterious earring appear inside. A mug keeps a shard of hell-ice cold forever. A mechanical toy contains a pocket plane. Levitating creatures speak in rebuses and do the work of an inscrutable being of godlike power. Rats which are harmless individually become intelligent, powerful, and malevolent as a group. How cool would it be if everything was like that? Planescape is a weird setting, but it is governed by iron internal laws and grounded in the familiar. The fundamental force shaping reality is belief, oriented to the poles of Law, Chaos, Good, and Evil. These are simple, even naive concepts. Everybody knows what angels, demons, and devils are, even if the nuances need a few words of explanation. The Blood War between the demons embodying Chaotic Evil and the devils made of Lawful Evil is therefore eternal, irreconcilable, and fundamental to the nature of the Multiverse itself. This logic makes Planescape coherent and understandable despite its enormous breadth, depth, and complexity, and the weirdness it begets keeps surprising and delighting because, once revealed, it becomes understandable. In Planescape: Torment, the laws of the Planes allowed Chris Avellone to ask questions like “What would happen if a demon of lust took a vow of chastity?” “What if a warrior’s blade was made of belief, and someone manipulated that belief to his own ends?” “What if a champion of Law was so dedicated to his cause he didn’t even notice he died in its defence?” and “What if a fragment of a deterministic collective consciousness embodying Law developed free will and a sense of self?” The logic of Planescape gave us Fall-From-Grace, Vhailor, Dak’kon, and Nordom. It made the town of Curst fall into Carceri when the weight of its evil became too heavy for its plane to bear. It made Trias a tragic anti-hero, rather than just another colourful villain. Just another day in the Ninth World. Planescape: Torment’s successor, Torment: Tides of Numenera, is set in Monte Cook Games’ Ninth World. It is a “deep-time” sci-fantasy setting, ostensibly on Earth some unspecified billions of years into the future. Deep-time settings have come a long way since Jack Vance’s The Dying Earth. Steven Erikson’s Malazan Book of the Fallen, for example, communicates an intense feeling of place, both in space and in time. There is a sense of unfathomable depths, inexhaustible mystery, and of truly deep time, but it is not unstructured. There are strata. We do not know exactly when the dinosaur-like K’Chain Che’Malle ruled the world from their flying mountain fortresses, but some of their artefacts remain and function, exuding an aura of geological age. There are ancient empires, gods both primal and new, and change in magic itself. Only a few of the world’s mysteries are revealed, but it never feels random, disconnected, or weird for its own sake. Regrettably, the Ninth World is no Malazan, but rather a throwback to The Dying Earth. Monte Cook has made it explicit that they will never define or reveal anything about the previous “worlds.” Its overarching weirdness must never be explained or organised into a coherent structure with an internal logic. Even an omnipresent feature like the Datasphere is intentionally left vague. It serves as a plot device allowing the GM to inject information where needed, but knows or reveals nothing about its creators, age, or any of the Worlds it has witnessed. It is all a random, relentless jumble of Weird, a kaleidoscope of colour which blurs into a uniform glitter the more time you spend looking into it. 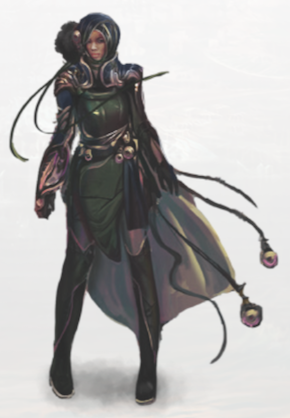 The key, as with everything in Numenera, is making it weird. A standard bear or wolf isn’t really going to cut it in this setting. But a twisted thing with a bearlike head, a four-legged frame like a wolf (oh, make it six legs), a magnetic-resonating metal plate where its eyes should be, and an extraneous sac of poison to spray? Now you’ve got a Numenera creature. 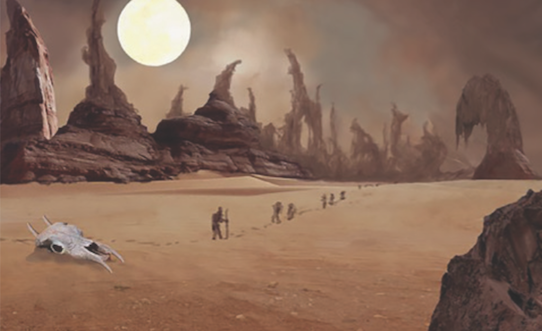 Sagus Cliffs, the location of the Torment: Tides of Numenera beta, is present in faithful detail in the state it is in before the Last Castoff’s arrival on the scene. The maps and many of the illustrations are plucked directly from the computer game or its concept art. Aligern, Callistege, Tybir, Fulsom, Imbitu, and many other major and minor characters from the game make their appearance. The Guide outlines their behaviour, background, and motivations, and even side quests pop up in “Hearsay” blurbs, although they are presented as adventure hooks only, rather than full-blown quest lines. There isn’t much in the Guide that’s not present, one way or another, in the game – and the game has a good deal of detail the Guide does not cover at all. 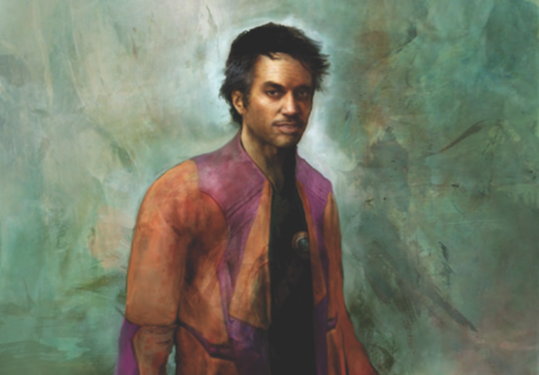 If you've played the Torment: Tides of Numenera beta, you'll recognise this handsome rascal. Other major locations, many of which have been revealed during the Kickstarter, the beta, or press blitzes, are described in comparable detail. There is the oasis of M’ra Jolios, a bubble of salt water in the middle of a perfectly circular desert, inhabited by the polymorphic, aquatic Ghibra who worship a god of diversity and inclusiveness, under assault by human terrorists from surrounding Jerboa who blow things up because reasons. There is fiery Ossiphagan and its denizens. There is a portal that leads to a crystalline world. There is a hitherto unrevealed location I won’t spoil here, which is an obvious reference to a prominent feature in Planescape: Torment, and a few others besides. 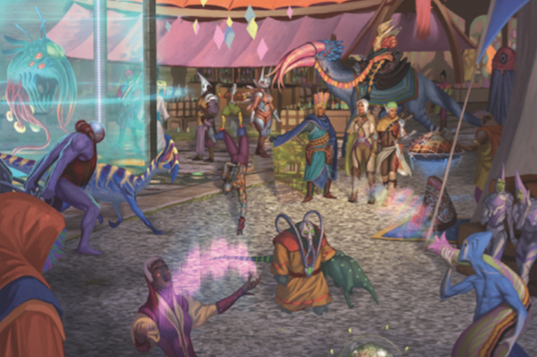 With one notable exception, all these locations are standard Numenera fare, not all that different from Guran, Stirthal, or any of the others in the Corebook, although written out in greater detail. They are colourful and filled to the brim with random weirdness, but have little by way of internal logic or coherence, let alone a sense of history or place beyond a general “atmosphere” helpfully described in margin notes. In places, their design is downright sloppy. For example, the Guide explains that the water-breathing Ghibra of M’ra Jolios are telepathic because sound carries poorly under water (the opposite is true), and they call their militia the Tears of Ny’kul. 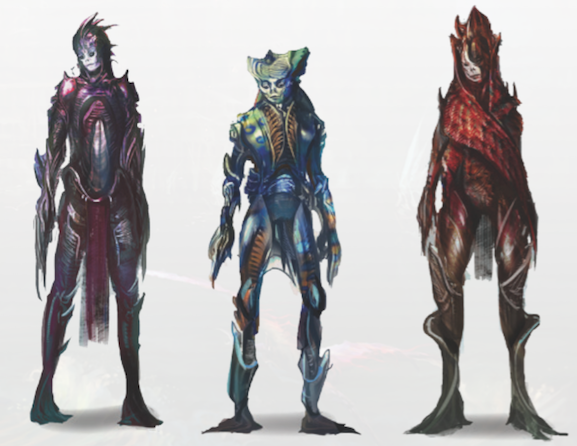 How would an underwater race even have a concept for tears? The one area where the Guide rises above its general level of all spice, no curry is the Bloom: a city-sized transdimensional predator inching its way along a ravine near Sagus Cliffs. Thought has gone into what the Bloom is, what it wants, what its capabilities and limitations are, and how it relates to the beings inhabiting and surrounding it. It has some of the internal logic so sorely lacking in the rest of the setting, and consequently the characters and factions in it are much more engaging and relatable than anywhere else. The Memovira is more than just a crimelord in fancy armour. The Bloom cultists and their lost prophet Chila are more than just another robe-wearing victim-sacrificing evil cult. The deranged, damaged, or changed human wrecks circulating in the Bloom’s bowels are more than just local colour. The Bloom shows that an imaginative world-builder can take the random bits and pieces of weird scattered around the Ninth World and make something genuinely exciting out of them. The Memovira: not only does she have great sartorial sense, she's an interesting character. In addition to the locations, the Guide covers various groups and factions active in Greater Garravia, and even dips a tentative toe into giving it a hint of history. For the most part, this lore is as disappointing as the locations. There is an ancient warlike race – the Tabaht – which is warlike because it likes war. There is an Endless Battle tidily contained in a corner of the map; it started because someone refused to do something someone else wanted and things got out of hand, continuing after the originators of the conflict disappeared from the scene. Not exactly cosmically ordained Blood War material. The Guide also translates some of the computer game’s mechanics to pen-and-paper form. The new Descriptors and Foci featured in the beta are all present and correct, with a few more thrown into the mix – presumably we will find these in the full game, whenever it is published. It also introduces two special descriptors – the aquatic Ghibra “racial option,” and the Castoff, with an optional rule that if everyone in the party is a Castoff, they can take an additional second descriptor. Notably, it says nothing about some of the computer game’s most interesting features, the Meres and the Fathoms contained, in some sense, within Castoff minds. Ghibra come in a variety of shapes, sizes, and colours. Sometimes they even have tentacles. Worse, however, is the Tides mechanic as described in the Guide. Tides are described as an alignment system which is also a force like gravity or magnetism, linked in some way to the Datasphere or perhaps some other intangible, ancient system floating around the Ninth World. There are five Tides, each of which embodies or represents a particular way of acting. Red, for example, represents passion, action, zeal, and emotion, and is exemplified by people like Joan of Arc and Adolf Hitler. The GM awards each Tide-sensitive player points in a Tide whenever they do something in tune with it. The points are used to determine the character’s Tidal affinity. However, the effects of the affinity are at the same time left vague (“a type of reputation”) and insanely powerful: whenever attempting something related to a Tide a character is attuned to, a success produces a Major Effect. Major Effects are a big deal, the kind of thing that turns an encounter around or makes short work of a tough obstacle. The standard rules produce a Major Effect on a natural roll of 20. Typical combat effects are extra damage, stun, and knockdown; for non-combat actions, it means “critical success” – faster, higher, stronger, more impressive, with greater effect, or perhaps a free action. Most importantly, any Pool points spent on the action are refunded. Consequently, a Tidally-attuned character can spend maximum Effort on all suitable actions for free – with no possibility of failure, if the Effort brings the task difficulty down to guaranteed success. The mechanic, in other words, requires the GM to be so intimately familiar with what each of the Tides is that he can award and track Tidal points on the fly, without interrupting the flow of the action or conversation, and the outcome is a vaguely-defined “reputation” plus something which allows attuned players to awesome-button every single tidally-conformant action with pyrotechnic critical successes every time. This, in a game explicitly intended to be as fluid, low-accounting, and low-arithmetic as possible, and one where most actions are already trivialised through the Effort and Recovery mechanics. Both the awarding/bookkeeping and eventual and occasional scripted results of tidal affinity can work perfectly well in a computer game, but defined this way for pen-and-paper… really, people, did you even playtest this? You too can now be as awesome as this character. Finally, a note about production values. This is one thing that Monte Cook Games does well. Even minor supplements are always beautifully typeset and illustrated, logically organised, and written in flawless language. The art is also, for the most part, exceptionally attractive. The Explorer’s Guide is no exception, even in the uncorrected pre-publication proof we were given to review. Every term is meticulously cross-referenced with the Numenera corebook, The Ninth World Bestiary, or other relevant sourcebooks. These are, however, designed as if they were physical books. The e-book PDF’s lack such basic features as a functional table of contents and working hyperlinks, and the font is only barely readable without undue eyestrain on a standard-sized iPad in portrait orientation. Also, the PDF uses AdobeRGB, a colour profile intended for print, which means that the colours will be washed out if viewed with something other than Adobe Acrobat Reader (for example, the default PDF viewers on Mac OS X or iOS). Since the Guide is, at this time anyway, only distributed as an e-book, this is unfortunate. I have played enough of the beta to be convinced that Torment: Tides of Numenera will be a good game – even a great game – but unlike Planescape: Torment, it will be that despite, not because of its setting. The setting does not preclude interesting characters, human drama, intricate puzzles, or quests with a bucketful of ways to approach them, and T:ToN has all that in spades. However, it will never have another Vhailor, Fall-from-Grace, Dak’kon, or Nordom, nor will a Curst ever topple into Carceri under the weight of its sin. With no cosmic laws to rebel against or serve to the bitter end and beyond, they simply cannot be. True to Numenera, The Explorer’s Guide hammers relentlessly on Weird, without demonstrating an understanding of what makes weird settings work. It has neither the philosophical possibilities of Planescape, nor the paleo-historical fascination of Malazan. It blows right through interesting and commits the one, unforgivable sin of a fantasy setting: it is dull, dull like page after endless page of MagicRealismBot tweets. In making room for anything, it excises everything that matters. If Planescape is a Gothic cathedral with sky-piercing spires and intricate stained-glass windows above, bottomless crypts below, and a vast nave where gargoyles lurk in shadowy niches in between, Numenera is a heap of baubles laid out on a street hawker’s rug: shiny, cheap, and tawdry. Only in the Bloom does The Explorer’s Guide attempt to make something greater and more coherent out of them. That alone is not sufficient to redeem it. All illustrations are screenshots from the e-book.